This morning, I woke up with a nasty sore throat. It was so painful to swallow. I could not get sick today, basically the first day of my Spring break. I have a lot of baking plans, I don't want my family scared of getting sick from my baking. I was determined to get better today. I got out of bed and immediately drank two water bottles, to help get some liquid in me. I went on Pinterest and looked up homemade sore throat remedies. 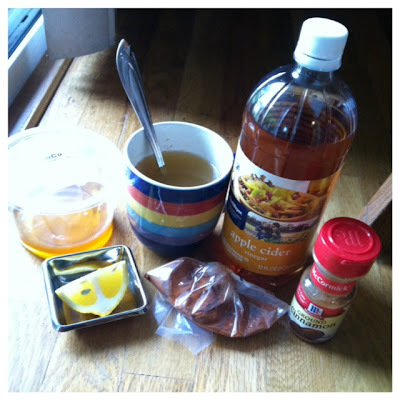 I concocted one of my own, using ingredients that seemed to be the main ingredients used in all the remedies. I brewed some black tea, just plain Lipton. Black tea provides you with tons of antioxidants. Inside this concoction, I included about a teaspoon of lemon juice, and a teaspoon of honey in this concoction. I drank probably five of those today. They were kind of addicting, and they helped a lot. Helped soothe my throat, and helped kill some of the nasty bacteria in my throat. I was really inspired today. Pinterest really fuels me and my need to make something. I wrote a list of things I needed for certain remedies. 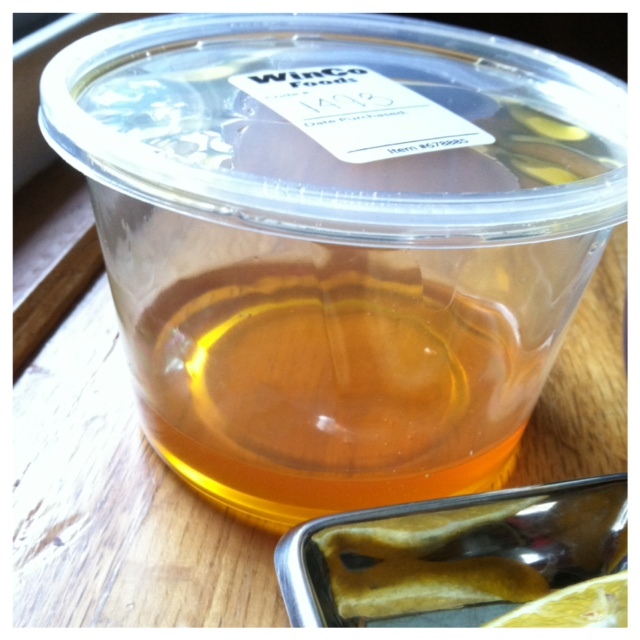 We went to WinCo and purchased some pure clove raw honey from the box of bees, we also purchased a garlic clove, a ginger root, more pure clove honey in the bear, orange juice, cayenne pepper and tumeric. I wanted to make these honey infused garlic cloves, but I read after I got home that the honey infused garlic takes several days to soak and make. I should have started them today, but I wanted something instant. I guess I was impatient... but I will begin the garlic cloves tomorrow and I will blog about them later this week. I am also interested in making my own throat drops, so I will probably make them later this week as well. Just more and more blog projects to fill my week with. Not complaining. I found another remedy on Pinterest. It seemed pretty simple and was pretty simple to make. Hot water, 2 tablespoons of lemon juice, 2 tablespoons of honey, a dash of cinnamon... although I wouldn't put the cinnamon in there again... and 2 tablespoons of apple cider vinegar. The recipe didn't say to add in cayenne pepper, but I added about 1/4 teaspoon of cayenne pepper in this drink. I was really excited to use my cayenne pepper! Next time I make this, I am not going to add cinnamon. I am absolutely in love with the honey that I got from the box of bees at WinCo... it is so fresh and pure, so raw. I love it! Also, on Pinterest, I had been seeing these homemade heating pads made out of rice and a sock. I have extra socks... I have rice. I wanted to make one! I got out my extra sock, got out some rice and my eucalyptus essential oil and made one! I didn't just make it, I 'snapguided' it. 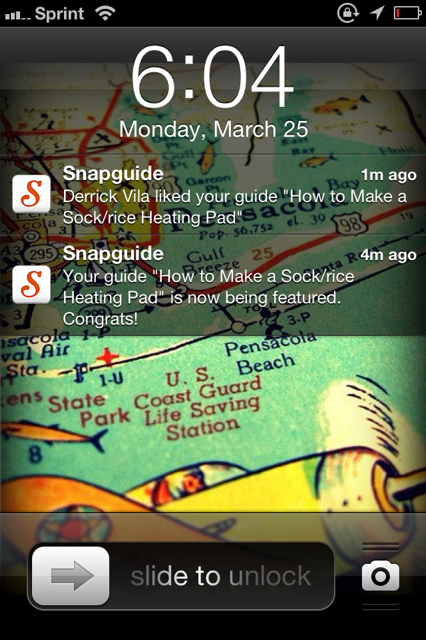 I found this new app called SnapGuide. 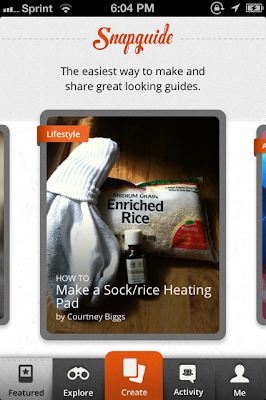 It is this app where you can share and make or look at simple picture guides on how to make things or do things. It was pretty easy! All you need for this simple remedy is no low-cut sock, 2 cups of rice, and a few drops of essential oil. Essential oil is optional, but since I am congested, eucalyptus oil is the key to breathing. 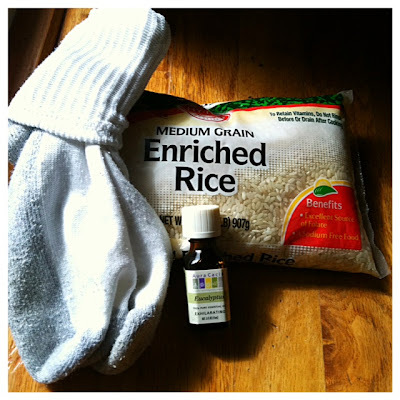 It's pretty simple to make... just pour the two cups of rice into the sock and tie the top of the sock off. Tie it TIGHTLY! You don't want any rice falling out. Since oil is optional, you can drizzle some essential oil on top of the sock after you microwave it for 45 seconds. I have been using it on the back of my neck. It is amazing and I love my homemade heating pad. My sock filled with rice guide on SnapGuide got popular really fast! It is already on the featured page!! I am so excited about it! That was a pretty exciting highlight of the day! I am also a big fan of remedies that aren't homemade... I LOVE AirBorne! The tablet thingies that make your water all fizzy and give you a blast of vitamin C! 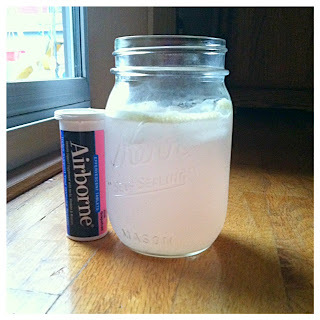 Pink Grapefruit is my favorite flavor of AirBorne, and I had three of those tablets today. It may have just been my mind playing tricks on me, but I thought I felt the AirBorne tingle in my throat, working! I like to think it was working instantly, makes me feel like I am actually getting better. I have always believed in the power of positive thinking. Everything is always cuter in a mason jar! 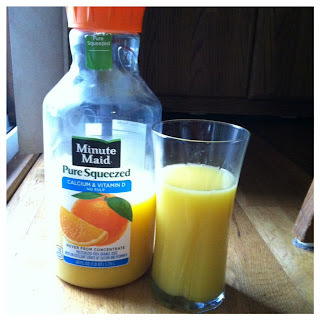 Another simple remedy that I love very much is drinking a big glass of orange juice. 100% orange juice does the trick. When you have a cold, vitamin C is what you need, and plenty of fluids. That is exactly what I did today. PLENTY OF FLUIDS! I had 3 big glasses of orange juice today, three of those AirBorne filled mason jars, 5 Camelbak water bottles, one of the hot water with cayenne pepper and all the lemon juice, honey and apple cider vinegar thing, and the very first thing I posted about: black tea with lemon and honey, I had five of those. My mom actually banned me from drinking for the rest of the night, and she told me to not drink like this tomorrow. I drank like a fish today! ha. Only for the benefit to help me get better. I ended the night with a relaxing shower. I sprinkled some eucalyptus oil on my shower floor to help get rid of my congestion. It helped a little bit. I just want my sore throat to go away! I want to be healthy again! All I have to say is Pinterest is AMAZING. 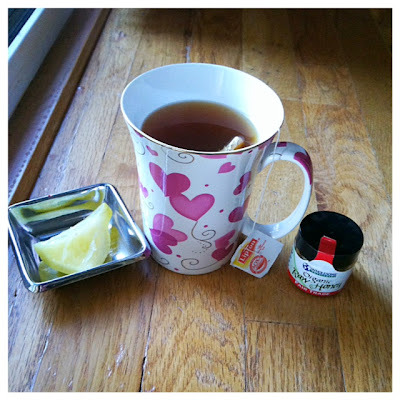 If you were looking for simple sore throat remedies, I hope these helped you out! They worked pretty great for me. Soothed my sore throat, and now it's not super severe. I'm not congested anymore, which is fantastic! And remember, vitamin C is always the key! ... got a little cheesy there.